More than 30,000 students at 30 Long Beach Unified School District schools participated in the recent Great Kindness Challenge week, bringing flowers to office staff, picking up trash on the playground, offering an extra smile, and engaging in other acts of kindness. Dignity Health of St. Mary Medical Center partners with schools on the annual event. This year’s partnerships, featured in the Gazettes, included art projects such as a rock labyrinth at Smith Elementary School, where each student painted their interpretation of kindness on a stone. The rock formation will become part of a permanent drought tolerant landscape at the medical center. Visit thegreatkindnesschallenge.com for more information on the global campaign. In other acts of kindness, 100 students each were surprised with a new bicycle during a recent assembly at Oropeza Elementary School in what has become an annual tradition for the Long Beach-based Velo Allegro Cycling Club, which promotes cycling and health. About 100 volunteers helped to assemble the bikes. “It made me cry. I was overwhelmed by the generosity of people who want to make a difference in the world,” Oropeza Principal Mona Cook said. The cycling group had selected Oropeza for an essay contest. 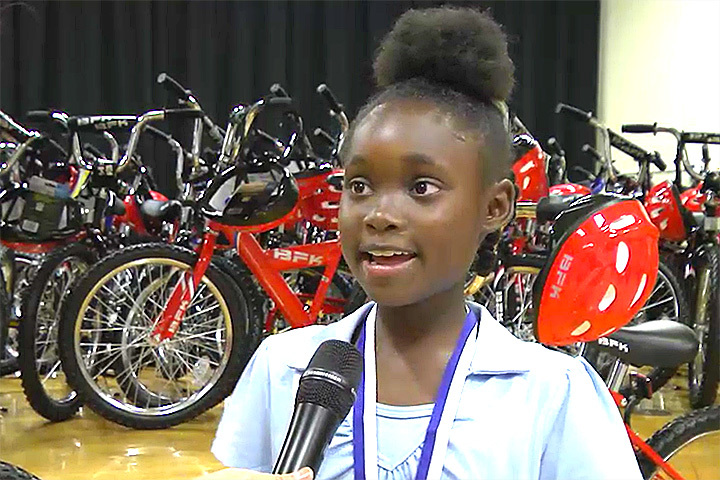 Students expected only the winning essayists to earn a new bike, but ultimately the auditorium stage curtain lifted to reveal more than 100 shiny, new bicycles – one for each child.